Things are heating up with the Live Spot Summer Sale! Get up to 25% off your order today! Stock is limited so come get yours quick. 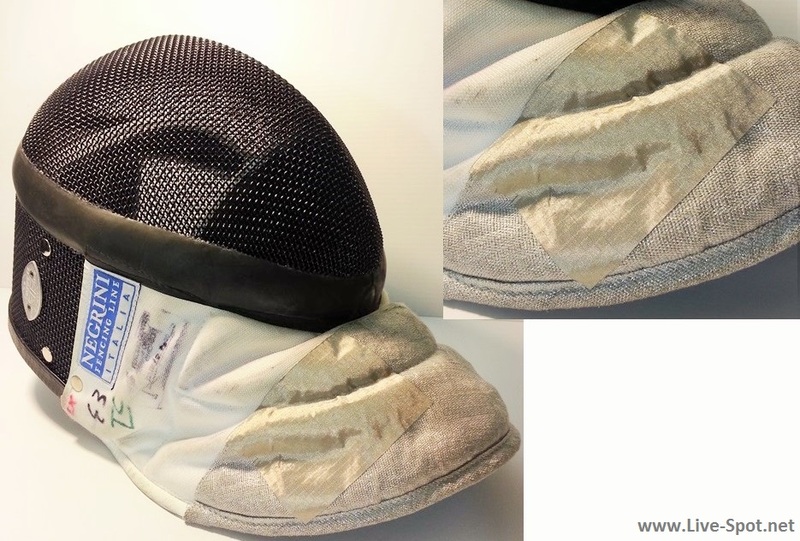 Are you a true fencing enthusiast? Answer a question right, get a big surprise! Get your fencing lame savers today! Some feedback from Cathy below! Glad I had them along at the World Cup in Athens last weekend. The weapons check personnel were very exact in testing lames and many failed. I used all the samples you sent me sharing with fencers from many countries. They were so happy to have their lames pass and amazed that your product was so easy to apply with no sewing! I now ordered more to have with me at all times. Thank you for your innovation! Daria Schneider used a small patch under her arm pit. It held up fine thru pools and her DE on day 2 but then fell off in her luggage on the way home. As a note in her case, she first rubbed the area with a wet paper towel to hopefully increase conductivity to pass but it did not pass so the lame was still damp when she applied it. Mariel Zagunis‘ lame was one that didn’t pass under the armpit! She had a new spare lame but wanted to wear her lucky one and glad she DID wear the lucky one that day! …Although it held up fine through the competition, when she got home it had turned green and actually leached the green onto her lame. 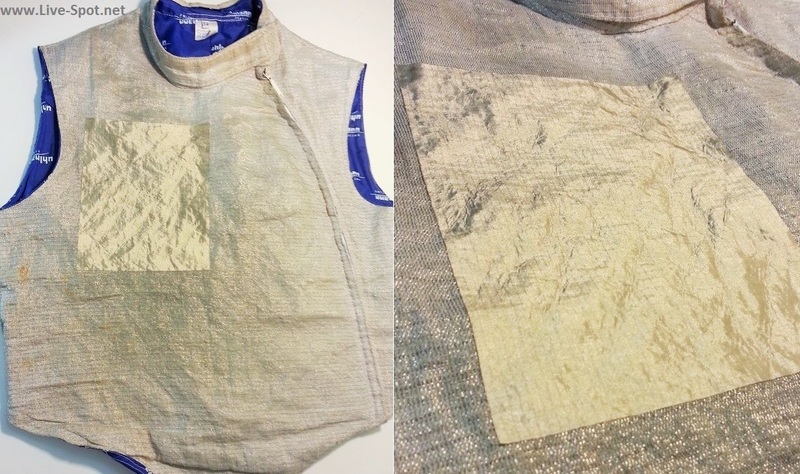 It is in the arm pit so I am sure it is a result of sweating but it is interesting that your product is more sensitive to the oxidation. Happy to support this great product. Thanks again for developing this great product! 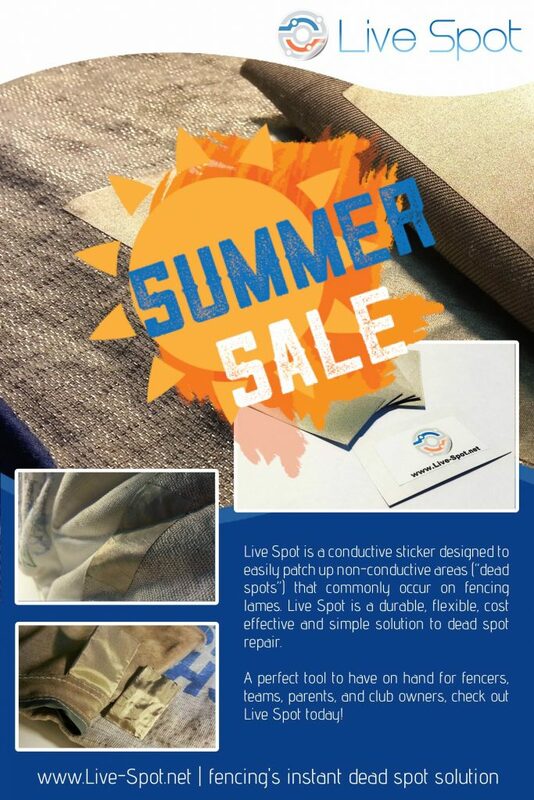 Live Spot is a conductive sticker designed to easily patch up non-conductive areas (“dead spots”) that commonly occur on fencing lames. 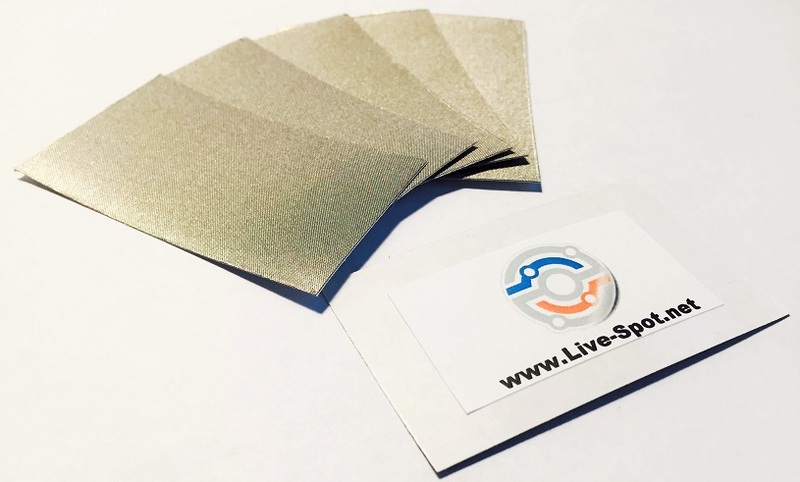 Live Spot is durable, flexible, and the simplest solution to dead spot repair. Durable, flexible, waterproof, sticky! After several hours of heavy bouting, Live Spot is still holding up perfectly fine. The adhesive has not peeled from sweat or movement, and hits have not penetrated the conductive surface. The lame was also machine washed to confirm durability. But there’s more…! Live Spot also works perfectly on silky lames such as the Leon Paul Ultralights! Live Spot is also a perfect fix for dead spots on mask bibs! 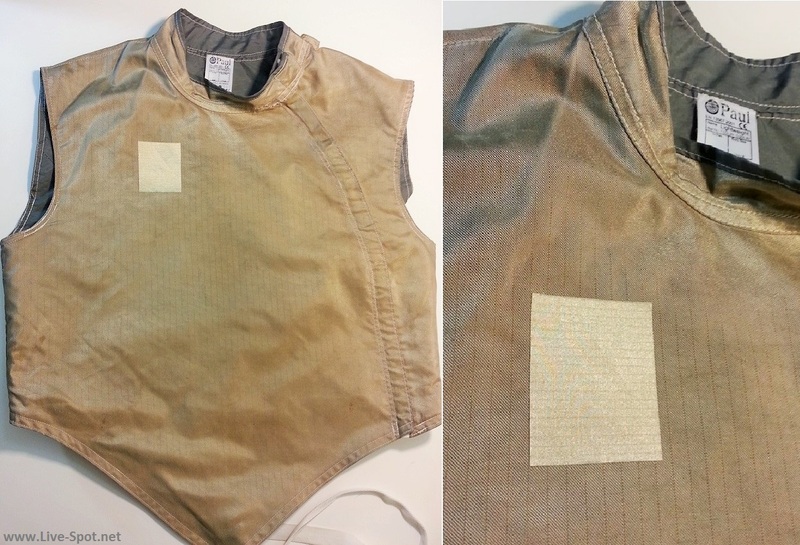 The sticker is flexible enough to easily contour to the ridges of the bib without falling off. Also a quick fix for a rusted tab where the mask cord attaches! Order your Live Spot today! Quantities limited! Receive product and website updates, as well as news on upcoming products and sales!